I remember what a revelation it was to discover, many years ago, that green olives and black olives come from the same plant; the difference is that green olives are harvested (and cured) before they ripen, whereas black olives are left on the tree longer. Later, I learned that black pepper comes from the same plant as white pepper; in the latter case, the dark outer hull of the peppercorn is removed. Still later, and even more surprising, was the discovery that black tea, green tea, and even oolong tea (in all their many varieties) come from a single plant, a shrub known as Camellia sinensis. These teas vary not only in color but in chemical composition—everything from the taste to the nutritional properties is extremely different from one type to another. White tea once again comes from the same plant. But it’s still full of surprises. 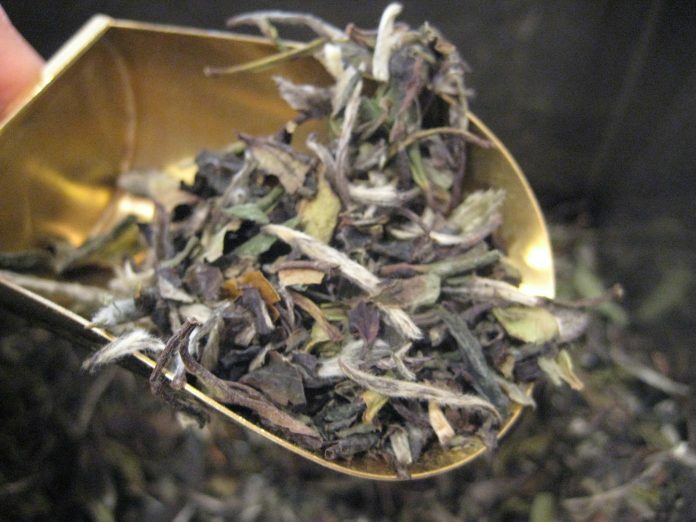 White tea comes from the youngest, tenderest tea leaves, which are often covered in tiny white hairs. In some cases, the leaves are protected from the sun while growing to limit the production of chlorophyll, which makes them lighter in color (though not actually white in most cases—more of a light greenish-gray). Immediately after harvesting, the leaves are dried briefly (without being rolled) and then heated quickly so that they do not oxidize. The result is a tea with a very delicate flavor—none of the “grassiness” sometimes associated with green tea, and none of the tannins associated with black tea. Tea experts say that you should continue handling it carefully even when brewing it—steep white tea in water that’s quite hot, but well short of the boiling point. Green tea is well known for its health benefits. For example, it contains antioxidants that may help to prevent cancer; it may also decrease LDL cholesterol. The nutritive components of green tea that give it these properties are found in greater concentration in white tea. University studies have also shown that white tea extract can kill bacteria, viruses, and fungi in the body (more so than extracts of other teas). White tea with a spoonful of honey sounds like a sort of super antimicrobial elixir. I’ve read some claims that white tea has more caffeine than green or black tea, but in fact it has much less. Well, sort of. The caffeine is present in the leaf when it is harvested, so a given mass of leaves from a particular plant will have a given mass of caffeine—and that’s true regardless of how long the leaves are permitted to oxidize. So, ignoring differences between plants and plantations (which can be significant), any tea leaf will have as much caffeine as any other. The difference is how much of that caffeine makes its way out of the tea leaf and into your cup. Brewed white tea has much less caffeine per cup than brewed green, oolong, or black tea (with increasing levels in that order)—partly because the leaves are larger, partly because they underwent less mechanical processing, and partly because the water for brewing is cooler. Because white tea is much rarer than other teas (and because it’s trendier), you’ll pay a premium for it, although the price has dropped considerably in recent years. Of course, that’s often the way these days: the foods with less processing cost more. But think of it as an investment in your health. Note: This is an updated version of an article that originally appeared on Interesting Thing of the Day on April 10, 2005.